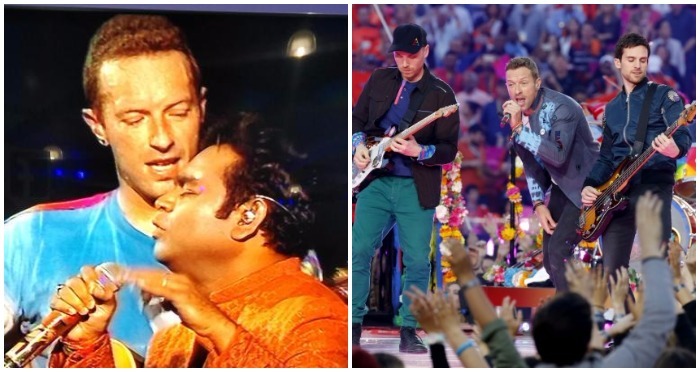 Coldplay Concert Videos: Chris Martin Singing ‘Maa Tujhe Salaam’ And ‘Channa Mereya’ Is Real Madness! Such madness, such infectious enthusiasm, such huge crowd has never been seen under one roof in India and on this was only and only for #COLDPLAY! After months of wait, the Global Citizen Festival featuring the British rock band Coldplay has come to an end but has left an everlasting impact on the fans. Held in Mumbai on November 19, 2016, Global Citizen Festival turned out to be one of the biggest concerts of India till date. After standing hours and hours in a queue, music enthusiasts from all across the country thronged the venue in Mumbai. Bollywood celebrities Shah Rukh Khan, Amitabh Bachchan, Alia Bhatt, Sachin Tendulkar, Arjun Kapoor, Malaika Arora Khan, Shraddha Kapoor, Parineeti Chopra and who’s who of the B-town made an appearance at the grand concert. One of the highlights of the concerts was when AR Rahman was called on stage by band frontman Chris Martin. Fans were thrilled when they together sang Rahman’s all-time best ‘Maa Tujhe Salaam’. That’s not all friends, he even went on to sing few lines of ‘Channa Mereya’ from the movie Ae Dil Hai Mushkil, leaving fans much to the delight and jump with joy. The concert ended on a high note and like never forgettable! Are you regretting not being a part of the concert? Hold on, here you go with a click button and enjoy Chris Martin singing Channa Mereya and Maa Tujhe Salaam. Believe, this is going to give you Goosebumps! Previous : Manager Of Fawad Khan and Other Pakistani Artists Exposed In #BlackMoney Scam!